Recipe Process Cut the eggplant into thin long pieces. Sprinkle turmeric powder, chili powder, salt and Besan or Maida. (this prevents the eggplant from being too mushy when fried). Keep aside for 15 minutes. Heat oil in a frying pan and fry the eggplant pieces to a golden brown color and drain onto a paper towel. 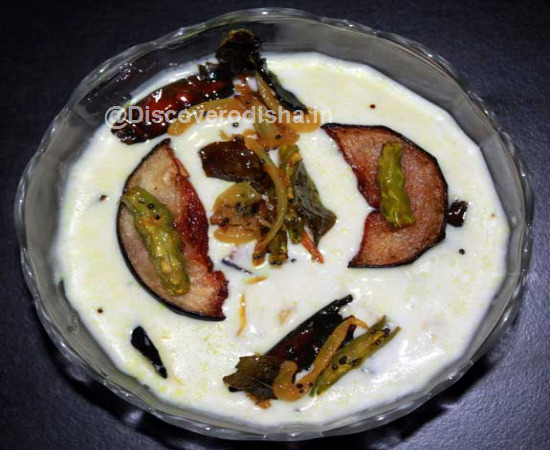 Pour the yogurt into a serving dish and add salt , black salt and fried Jeera powder and mix well. Add water based on the consistency you like. I like mine a little watery... Heat little oil in a pan and splutter mustard seeds. Add green chillies and grated ginger and curry Leaves.